Winner in the 2016 FCRAs "Miraculous Magic" category! Esperance is a medieval land coated in magic and wonder. Heroic princes slay demons and dragons and beautiful princesses slumber beneath curses cast at birth. In this land, fairy tales are normal and every so often, they become entwined in the lives of those around them. Zenobia was traded to the Grim Reaper by her own mother. Trained to be Death's successor, Zenobia's only hope at a normal life lies in winning Prince Charming's heart. But there's someone out there who is convinced that Zenobia isn't as normal as she appears and will stop at nothing until she realizes the same. 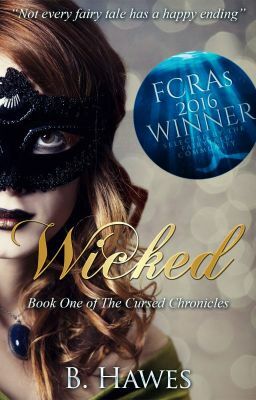 Morgana has lived her life forced to lure children into her master's candied home of horrors. Finally able to break away, she searches for a way to escape her past and the miserable curse that's been placed upon her. The question is: does Prince Charming hold the key to breaking her curse or is it the young and handsome leader of a band of thieves? Princess Ruta Livor lived her life in the lap of luxury: ruling the land by day and beheading those who defied her every evening. Who could have foresaw her death? Not her. She certainly hadn't thought that Nate, her childhood rival, would be the one to take her life. Revived by fairy magic and thirsting for revenge, the corpse of Ruta Livor is on a quest to wreak havoc on Nate and all who opposed her rule while she lived. All three live in the magical land of Esperance, a land filled with fairy tale creatures, both good and bad, life-altering spells, and fantastical beings. All three have been cursed by powerful and dangerous magic. All three want a happily ever after. Unfortunately, there's only one prince. ------ Based on classic fairy tales such as "Beauty and the Beast", "Cinderella", "Godfather Death", and more. ____ © Copyright 2014-2016. Brittany Hawes.